Cedar Mountain is dedicated to building top quality American-made spa covers, and providing you with excellent customer service for residents of Portland, OR. We have been doing so for over 35 years. Each spa cover is made to withstand the weather changes that occur in the Northwest, and each is assembled by hand. 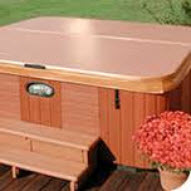 They are carefully inspected in order to make sure you are provided with a top quality product for you hot tub or spa. 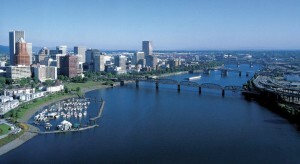 Portland is about 145 square miles, and is the home to more than 632,000 people. The weather is characterized as, being both “oceanic” and “Mediterranean”. The summers are typically dry and warm, while the winters are cool and rainy. One of the features of Portland is their various bridges that are not only functional, but also add to the beauty of the Portland skyline. In fact, Portland, OR is fondly known as, “Bridgetown”. Many of the bridges are historical landmarks. They include: the Hawthorne Bridge, the Steel Bridge, and the Broadway Bridge. The newest bridge in town is the “Tilikum Crossing”, where trucks and cars are not allowed (except emergency vehicles), but instead, it transports commuters from downtown Portland to Milwaukee via streetcar, or tri-Met MAX. Walkers and bicyclists are also allowed on this suspension bridge. Other notable bridges include: the Burnside Bridge, the Ross Island, the Sellwood Bridge, St. Johns Bridge, Glenn Jackson Memorial Bridge, Interstate Bridge and the double-decker Marquam Bridge. There are a total of 11 of these magnificent structures around Portland, of which, 5 are draw bridges. The Hawthorne Bridge is the oldest in Oregon, and the oldest vertical lift bridge in the USA. Many commuters travel upon this bridge on a daily basis, including more than 1,500 bicyclists. The St. John’s Bridge was built in 1931, and has beautiful high arches that look somewhat “gothic”. Just below this bridge is Cathedral Park, where the Portland Pirate Festival is held each year. 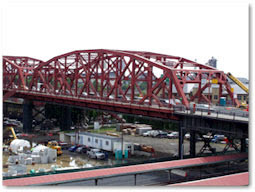 The Broadway Bridge – Known for its red color, the Broadway Bridge opened in 1913, and is the largest Rail Bascule Bridge in the world. This bridge is also pedestrian, bicycle and vehicle friendly. There are two facilities in Northwest USA, one in Hayden, ID and the other in Kent, WA. In addition, there are more than 150 dealers nationwide that are available to meet your needs. One of the many Cedar Mountain spa cover dealers in Multnomah County is ready and willing to help you choose the best quality product, in order to meet your specific spa or hot tub cover needs. To find a dealer closest to you, please visit the, “Dealer Locator” page. For more information about how you can become a spa cover dealer in the Portland, OR area, please fill out this new dealer registration form or contact us for more information.